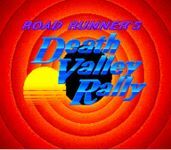 Road Runner's Death Valley Rally is a video game released for the Super NES. It is based on the Looney Tunes characters Wile E. Coyote and Road Runner. Many attribute the gameplay in this game to the Sonic the Hedgehog games, due to its intense speed and gravity defying properties (such as running up walls). The player controls Road Runner, who is to be guided across a series of levels to cross the finish mark, while avoiding Coyote and his contraptions. Coyote has a unique method of ambush for every level, ranging from the Acme BatMan outfit to explosives, and for every level there is a cut-scene of the contraption failing once the player crosses the finish mark. After completing the three main levels in an episode, the Road Runner has to battle Coyote, who is armed with a more advanced contraption. Source: Wikipedia, Road Runner%27s Death Valley Rally , available under the CC-BY-SA License.